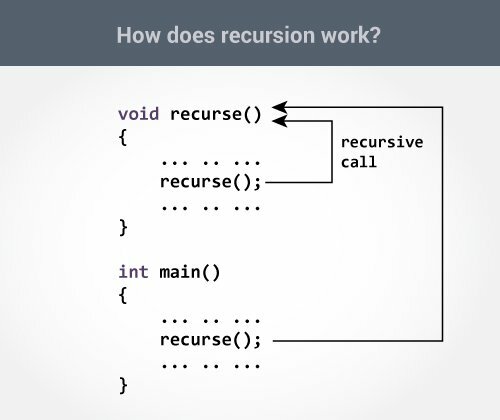 How recursion works in C++? The recursion continues until some condition is met. 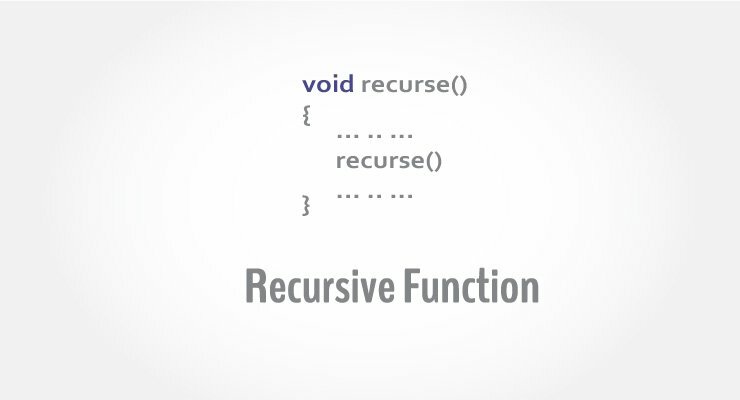 To prevent infinite recursion, if...else statement (or similar approach) can be used where one branch makes the recursive call and other doesn't. Explanation: How this example works? Suppose the user entered 4, which is passed to the factorial() function. In the first factorial() function, test expression inside if statement is true. The return num*factorial(num-1); statement is executed, which calls the second factorial() function and argument passed is num-1which is 3. In the second factorial() function, test expression inside if statement is true. The return num*factorial(num-1); statement is executed, which calls the third factorial() function and argument passed is num-1 which is 2. In the third factorial() function, test expression inside if statement is true. The return num*factorial(num-1); statement is executed, which calls the fourth factorial() function and argument passed is num-1 which is 1. In the fourth factorial() function, test expression inside if statement is false. 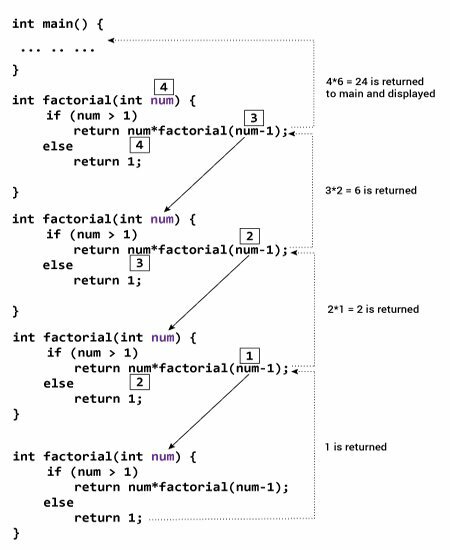 The return 1; statement is executed, which returns 1 to third factorial() function. The third factorial() function returns 2 to the second factorial() function. The second factorial() function returns 6 to the first factorial() function. Finally, the first factorial() function returns 24 to the main() function, which is displayed on the screen.